You don’t like scrambled eggs. Not sure if it’s a pregnancy thing or not, but I haven’t been big on the texture of scrambled eggs lately. However, I LOVE tofu and a good savory breakfast. For me, the tofu scramble cuts some of the richness (i.e., cholesterol and fat) of scrambled eggs, but the protein content makes it just as filling, if not more so. It keeps all week. For maybe 30 minutes of work, you can prep the scramble on Sunday night (or whenever your “weekend” ends), portion it into your favorite food storage containers (I store mine in one big batch in this container), and have breakfast all week. Unlike reheated scrambled eggs, which tend to lose their original fluffy glory, tofu retains its light texture without becoming rubbery or chewy. It’s versatile, with a short shopping list. All you REALLY need is tofu and turmeric. I added onions, peppers, and potatoes to this basic veggie version, because they’re inexpensive and often on hand in my pantry. Last time I made it, though, I added kale, black beans, and a little water after adding the turmeric, and it was even more substantial and healthy. If, like me, you’re not a strict vegan, there’s no shame in topping your tofu scramble with a sprinkle of grated cheese. 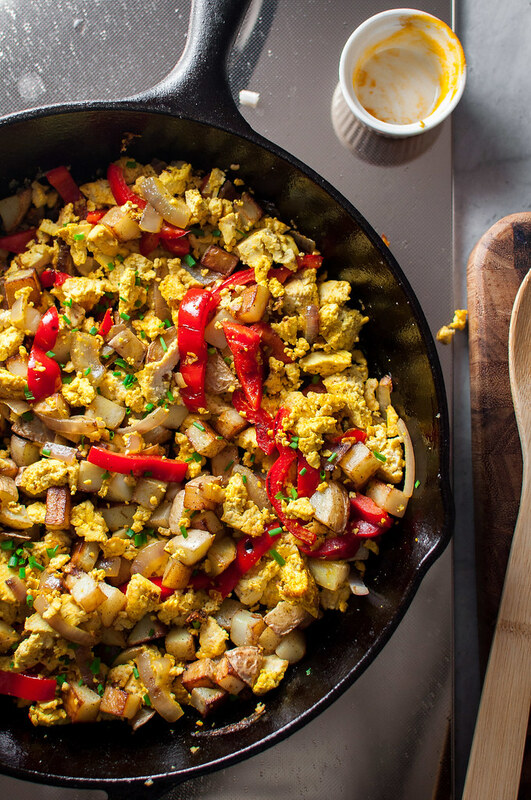 Consider this recipe a launchpad into the world of tofu scrambles. It’s money saving! See previous bullet point. 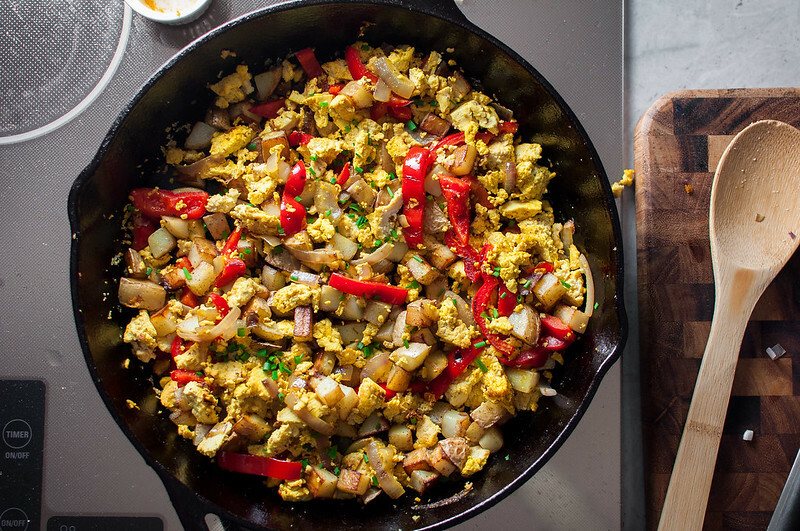 There are no fewer than 295,000 results online when you Google “tofu scramble recipe”. Many are similar, but I’ve found this process and these ingredients work really well for me. I’m just not a big fan of the taste (and price) of nutritional yeast, and turmeric solves for the scrambled egg color, and extra color and health benefits, quite well. Now that my Fresh Direct order has arrived (oh, the drama), stay tuned this week for another grocery delivery service review and the menu I’m making with it. I also have pregnancy update and maternity clothing essentials posts coming up as soon as I can get to them, in between researching baby wraps, car seats, and strollers…suggestions welcome! Tofu is a great way to turn scrambled eggs into a healthy, make ahead breakfast. 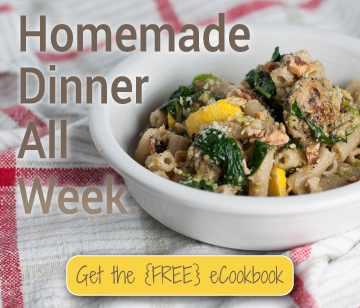 It's packed with protein, high in calcium, and retains it's tender texture when stored all week. 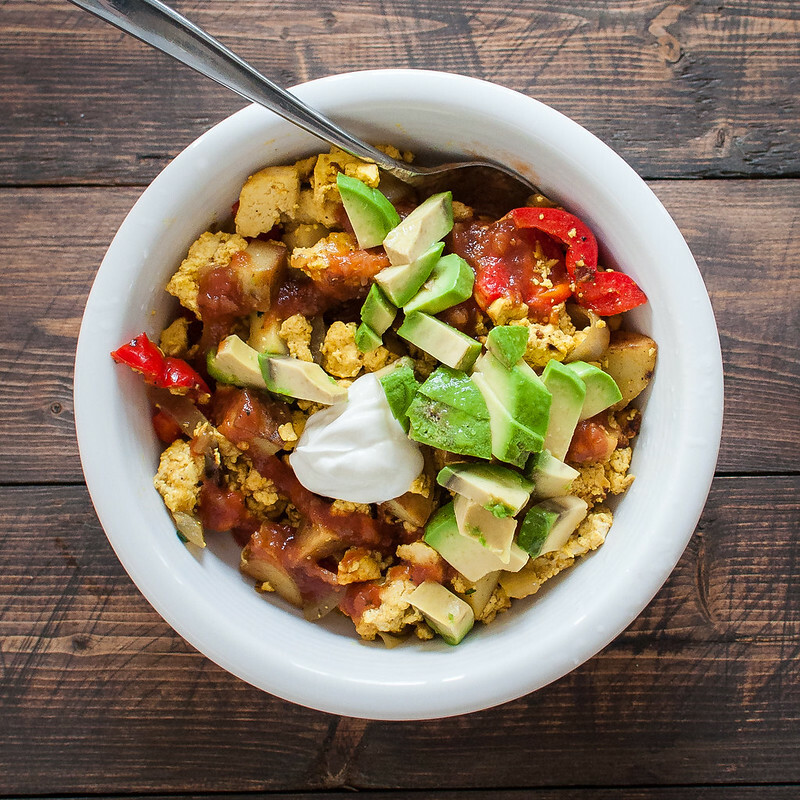 This is a pretty basic tofu scramble recipe: once you get the hang of it, add your favorite veggies (like some greens or mushrooms) or even more protein, with a can of drained black beans. Drain tofu (see description and picture here) between layers of clean towels with a heavy object on top, about 15 minutes on each side. Meanwhile, dice the potatoes into ½" cubes and prepare the other ingredients. Heat a cast iron or nonstick skillet coated with oil (about 1½ tablespoons) over medium-high heat, add potatoes, stir, and spread in a single layer. When the potatoes have browned on one side, stir infrequently and cover the skillet as they continue to cook, so they tenderize more quickly. Once easily pierced with a fork or paring knife, season potatoes with salt and pepper and remove to a bowl. Add more oil to the skillet. When hot, add onion and pepper and cook a couple minutes, until beginning to brown and soften. Crumble drained tofu into large chunks into the skillet, stir once, then cook a few minutes at a time without stirring, until tofu browns in places. Add turmeric and a sprinkle of salt and pepper to the skillet and cook a minute more, stirring. Reduce heat and stir cooked potatoes back into the tofu. Adjust seasoning to taste. Store cooled scramble up to five days, reheating in the microwave or a skillet (with a splash of water or vegetable stock). Serve with lime juice, salsa, avocado and/or sour cream. Note: This page contains affiliate links. It does NOT contain sponsored content. Affiliate links (to products I recommend, on Amazon) offset my ingredient and website maintenance costs, so I can keep bringing you morning recipes like this one. Thanks!